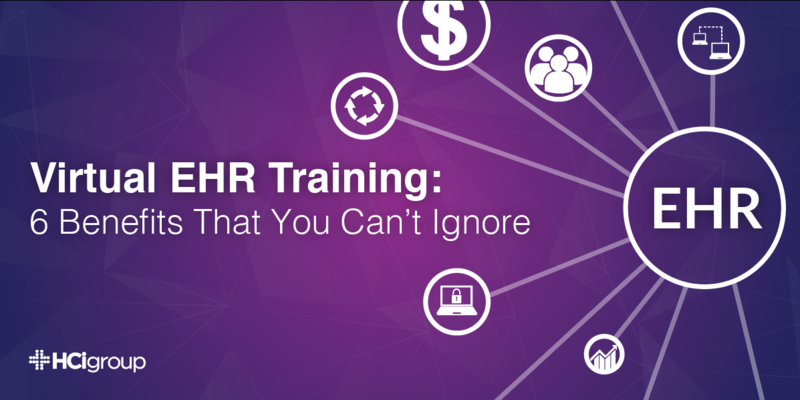 EHR training can strain budgets, stress users and squeeze your healthcare organization’s resources. But none of this has to happen. You don’t have to stretch to hire enough trainers or struggle to schedule enough sessions, nor do you have to scramble to get ample space for all of your training. Healthcare organizations are turning to virtual EHR training because of the affordability, efficiency and effectiveness that it offers. You can also minimize productivity losses, improve adoption rates and increase the return on your investment in your new EHR system by allowing users to participate in online, instructor-led training. EHR training needs to be effective but it doesn’t need to be expensive. A virtual EHR training program is a cost-effective way to ensure that all of your end users can use your new electronic health record system. You don’t need to hire as many trainers because certified facilitators can teach more classes remotely than they would if they were on site. This also reduces travel costs for trainers such as cutting room nights, plane tickets and rental car fees. You can save on travel costs for participants as well. You don’t have to pay for end users to drive to a distant location and possibly stay in a hotel because they can log into training from their primary facility instead. Multiple trainers send multiple messages. Though they may cover many of the same essentials, they might differ in the workflows that they teach or the tips that they offer. But with virtual training everybody receives the exact same message, thereby eliminating potential confusion as you try to get everyone on the same workflow. Also, the training curriculum generally is approved by nursing leadership, thus increasing its relevance and usefulness. Virtual EHR training isn’t confined by the size of a room. Many end users from various locations can join “one virtual” class. This allows you to broadcast training to multiple classrooms in multiple facilities within your healthcare system. One training session served thousands of end-users across 26 hospitals. Similarly, multiple applications can be trained in the same training room. This reduces the amount of training space that you need. You can have users from your ER and your medical research departments sitting in the same room, participating in different sessions just by equipping them with headsets. Such efficiency is particularly beneficial when space is scarce. Users require less time for training because they don’t have to travel far. This reduces the amount of time they have to take away from work. Virtual training also avoids stressors like traffic jams, which can set participants up for failure by getting them off to poor starts. Perhaps most importantly for participants, they are not pressured to keep up with peers in a classroom. Virtual training provides a more comfortable setting for asking questions, like through an instant message to the trainer or a posting to a platform that maintains their anonymity. Such comfort improves participants’ retention of the training curriculum. EHR training is often a complex and costly challenge, but it needn’t be so. Virtual training offers an efficient solution; just consider the benefits above. Want to learn more about virtual EHR training? Contact us today.